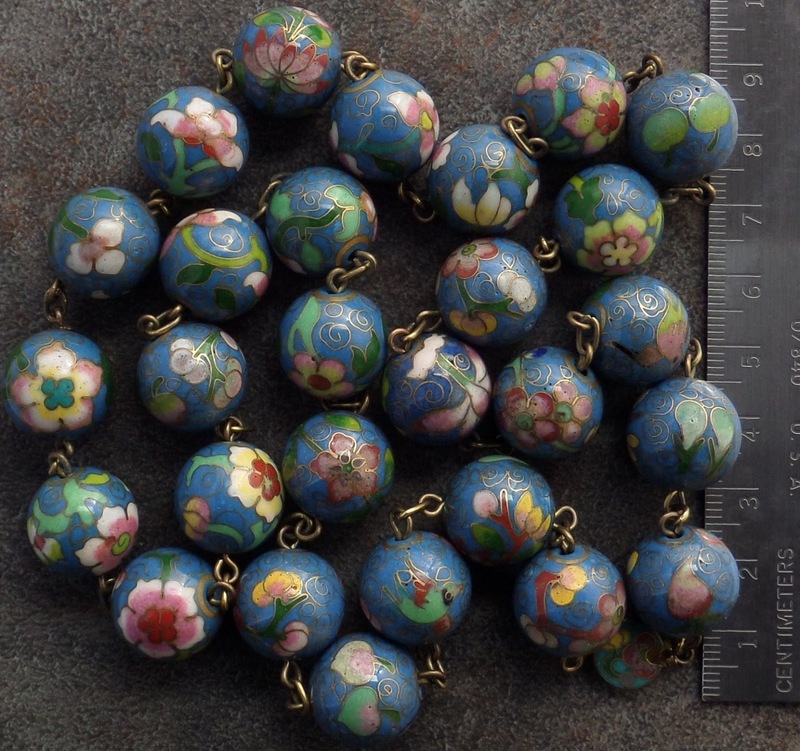 In a discussion at beadcollector.net, we wondered if it was possible to date a Chinese cloisonné necklace by the style of clasp. 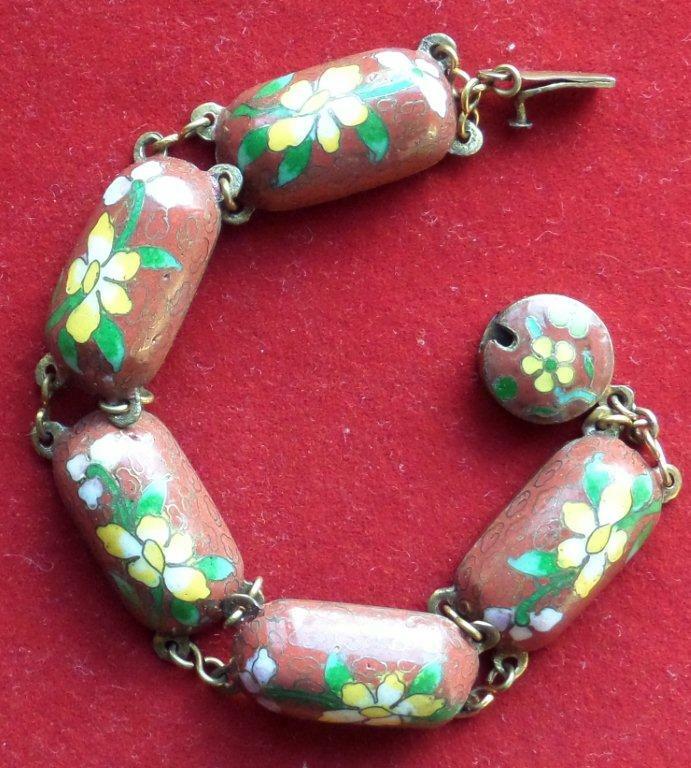 Those who frequent online auction sites may have noticed a type of floral cloisonné clasp that some vendors imagine dates from the Deco era (roughly between World Wars I and II, or the 1920s-early 1940s). I’ve termed this “The Lotus Clasp,” as that’s my best guess as to what the flower might be. In this photo of beads in my collection, the green strand on the bottom is the earliest, with a claimed date of 1950s (“According to the daughter, this was purchased in Asia in the 50s”). The seller of the white ovals necklace at the top stated that she had imported this and similar necklaces in 1981. The craftsmanship of this white necklace seems a bit more hurried and typical of mass production; hence I placed it at the top end of the sequence, although I do not know the dating of the other necklaces, or whether the Lotus Clasp continued to be used past the 1980s. Green beads from 1950s at bottom, white ovals from 1981 at top. "Purchased in Asia in the 50s." With original box. I also have a strand of small turquoise rounds and slender ovals, which appears similar to another necklace that was sold on eBay – my strand has what seems to be a vermeil filigree clasp, the eBay strand has a Lotus Clasp. 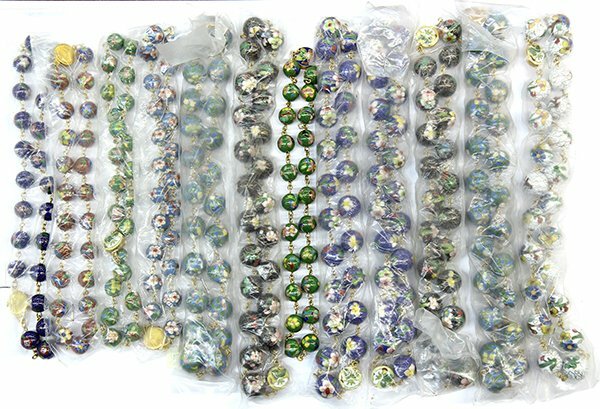 These beads are comparatively dainty – the rounds are only 8mm. 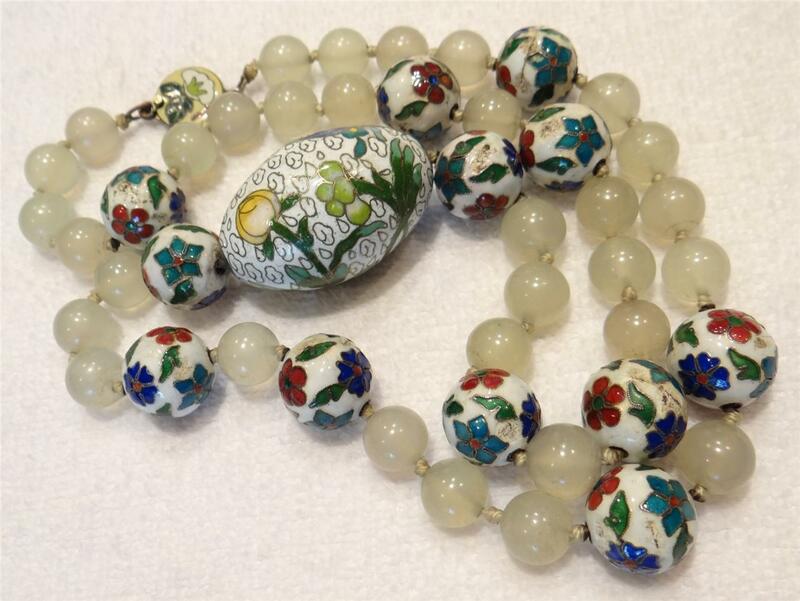 The eBay seller stated that a Chinese friend who travels to China to visit relatives purchased this necklace there in the 1960s. Thus we have three accounts that seem to place this clasp within a late 50s – early 80s timeframe of about 25 years. As to the quality of the workmanship on these beads, they’re quite nice, displaying good detail, often a variety of floral designs and colors throughout the strand, plus an occasional butterfly. The Lotus Clasp is a machine-stamped design – the cloison wires are not hand-applied. Examining the clasp with a 10X loupe, one can see that the enamel has been carefully applied in just the right amount (usually) to result in a shiny fire-polished glaze that requires no subsequent grinding and polishing. There are no polishing artifacts such as parallel lines and matte areas that can be seen on wired cloisonné. 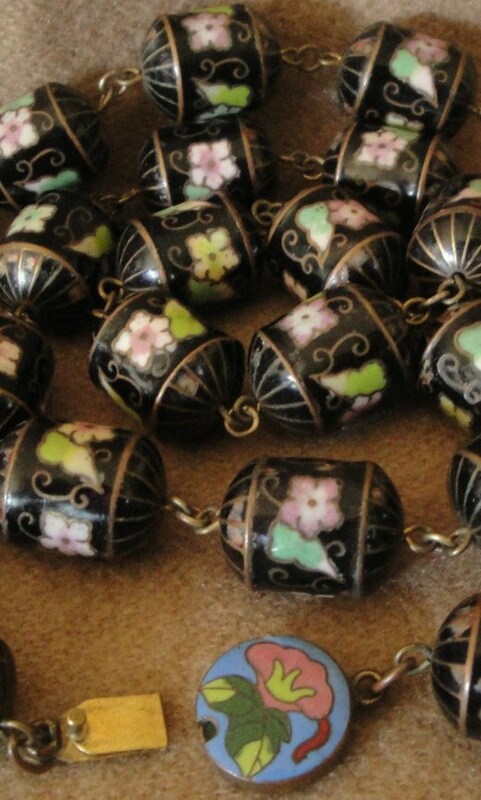 1) The cloisonné clasp beads are large, and feel lighter in weight compared to the Lotus Clasp necklaces. 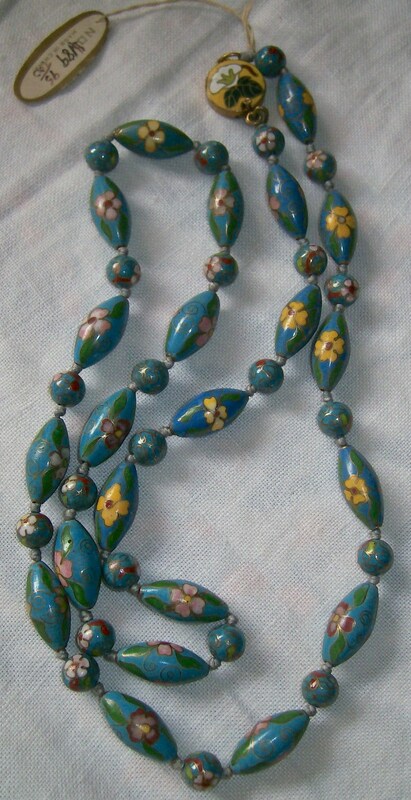 2) All three cloisonné clasp necklaces are chained, not strung on cord or twisted silk. 4) All the Lotus Clasp beads mainly feature JingFa clouds, with an occasional peaked spiral cloud to be found. The reverse appears in the cloisonné clasp necklaces – these use mainly older peaked spiral or crinkle clouds, with JingFa clouds only on a certain few beads. 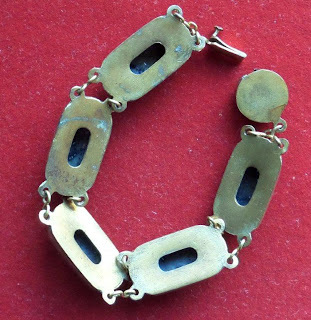 It seems unlikely that the Lotus Clasp pre-dates World War II; rather, it appears to be an artifact mainly of the 1960s and 70s. It also appears with other cloisonné-type beads, such as those with cinnabar or stamped or twisted wire patterns. 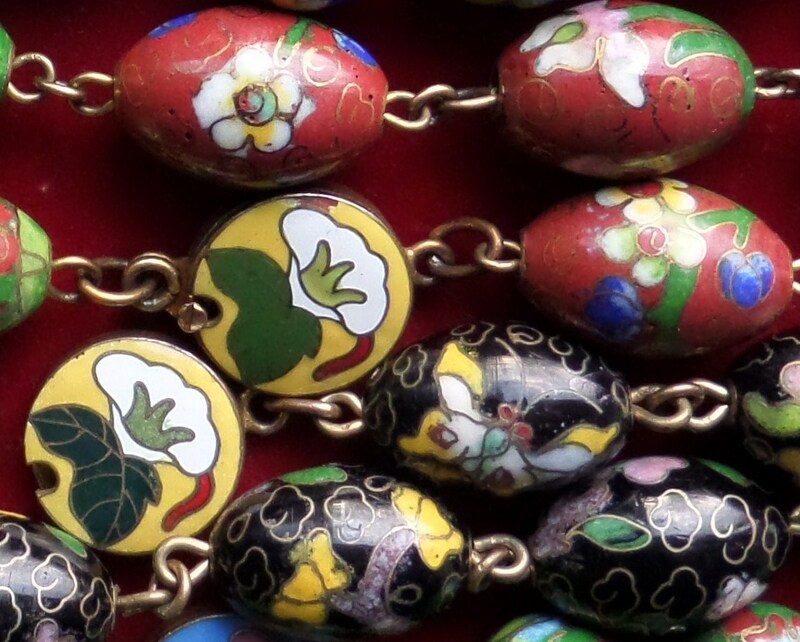 As to dating those necklaces with actual wired cloisonné clasps, the evidence is puzzling. 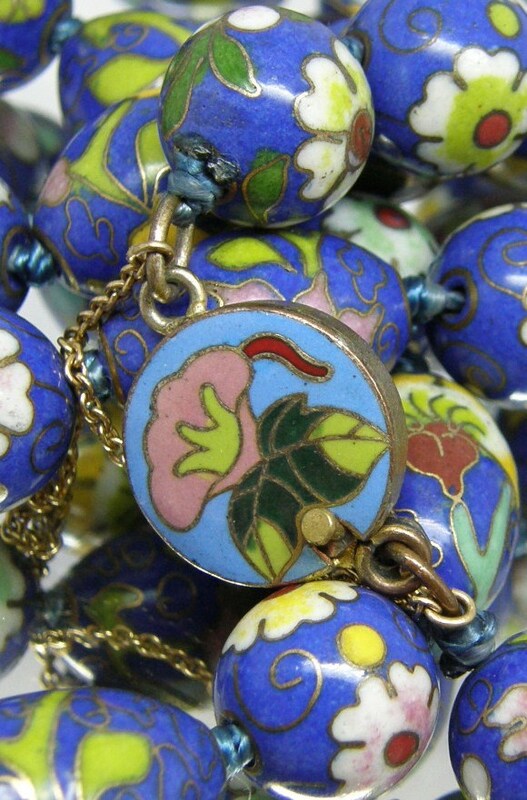 For example, the blue and light blue background enamels look identical to necklaces with the Lotus Clasp. Older artists? Artistry vs. mass production? Different workshops? UPDATE: An eBay seller described one of these clasps as picturing a "morning glory." OK, that works. According to Wikipedia, the morning glory is a Japanese symbol for summer. Hello! Thank you so much for all of this information. 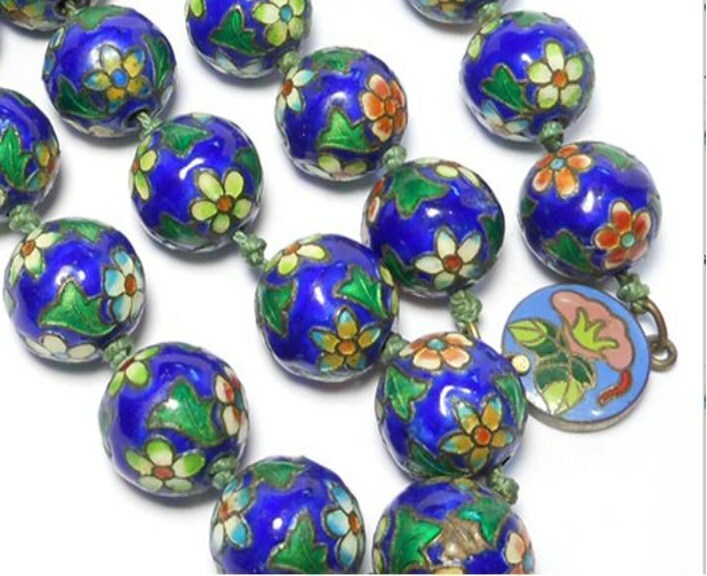 I started reading in an attempt to date a cloisonne necklace that I recently purchased, and lo an behold you have an almost identical piece pictured here...and its a belt! I would like to share pictures here of my find to help the cause. It will also likely be up for sale on rubylane once I can get some more info on it. If someone can tell me how to post photos I am happy to share. Sounds like a really interesting piece, Katrina. I think Blogger will let you post a pic in a comment.